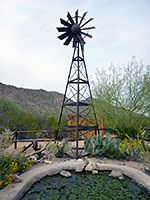 Although located in Pinal County, along its northern edge, San Tan Mountain Regional Park is administered by neighboring Maricopa County; one of 12 such preserves, centered on hills, rivers or lakes in the Sonoran Desert surrounding Phoenix, others including Lake Pleasant and White Tank Mountain. 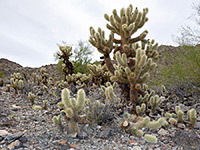 The San Tan Mountains are typical of the rugged ranges in this part of the desert, being rocky, steep-sided, split by ravines and densely covered by saguaro and other cacti, and while the majority of the highest elevation peaks are within the Gila River Indian Reservation and so generally off-limits for hiking, the eastern section is in the regional park, together with a lower, detached summit (Goldmine Mountain), and the flatter land in between. The park contains over 10,000 acres of unspoilt desert terrain, measuring over five miles north to south. The scenery is not much different to any other mountainous area in the Sonoran Desert, and the place is less spectacular than for example the Superstition Mountains to the north but the landscape is still very impressive, and can be seen close-up by over 20 miles of intersecting trails, which offer varied views, of the peaks, the nearby higher mountains, the cactus and creosote flats, desert plains to the east and the Phoenix suburbs to the north. Like all the regional parks the paths are well-maintained, signposted at every intersection and easy to follow, and the park has plenty of facilities including a visitor center, ranger station, horse staging area, nature trail and picnic area. There is at present no campground, though one might be added in the future - the park is relatively new, and some aspects are still being developed. The regional park lies at the southeast edge of greater Phoenix, bordering Gilbert and Queen Creek. The main entrance is on the east side, along Phillips Road, off Thompson Road, and here are found all the facilities, including a large carpark. The entrance is open every day of the year, and admission (2019) is $7 per vehicle. Two lesser-used, non fee-paying approaches are from the north, along Wagon Wheel Road/Skyline Drive (the Goldmine trailhead), and in the south, along Brenner Pass Road, the Rock Peak Wash trailhead; all roads are paved. Elevations in the park range from 1,550 feet, along the northwest edge, to 2,495 feet, in the Malpais Hills, which form the eastern portion of the San Tan range and are characterized by a very steep north face, rising abruptly from a gravelly wash along the base. Other named features include Rock Peak, a detached, conical summit near the southern entrance, and The Gap, a pass through a narrow ridge. 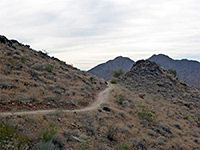 San Tan Mountain Regional Park is crossed by over 20 miles of intersecting trails, allowing many loop hikes, the shortest 1.6 miles (Littleleaf Trail and the south end of the Goldmine Trail). The most strenuous is the Goldmine Trail, as its central section involves an ascent and descent of steep, rocky slopes, in the middle of Goldmine Mountain. The remainder of the routes, although sometimes long, are generally easy, most either crossing flat land between the peaks, or following dry washes. All trails are multiple-use, open to cycles and horses, any many are wide, formerly vehicle tracks. Trails are summarized below. Perhaps the best medium length hike, experiencing a variety of scenery and environments, is the 7.5 mile loop along the Goldmine, Dynamite, San Tan and Moonlight trails. San Tan Trail, 6.4 miles - long circuit over fairly level land in the middle of the park, forming an 8 mile loop with part of the Goldmine Trail. 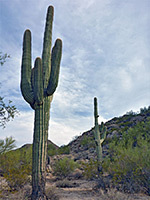 Stargazer Trail, 0.8 miles - easy, partly elevated path across sloping ground, linking the San Tan and Moonlight trails.